You can hover over an event to see its additional description. Border colors denote locations, whereas background corresponds to the type of event. IM PAN Śniadeckich 8, see the map. MIMUW Banacha 2, see the map. introductory lectures, which should be accessible to undergraduate students and even "greenhorns"
In publications an acknowledgement "This work was partially supported by the grant 346300 for IMPAN from the Simons Foundation and the matching 2015-2019 Polish MNiSW fund” would be appreciated (see also the main page). miniPAGES lasted 9 weeks. Scientific activities in Warsaw (i.e., except weeks V and IX) took place at IMPAN and MIMUW. 4-6.05, lectures and seminars at IMPAN and MIMUW; no activities on Monday and Tuesday due to a public holiday on 3.05. Also, as an additional activity you might consider: Jankowski lecture in Gdańsk accompanied by a mini-conference on 6-8.05. 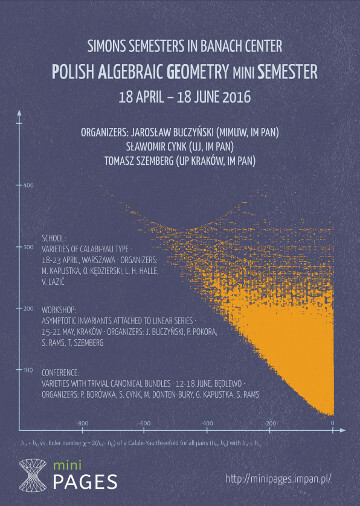 16-20.05, Cracow: Workshop "Asymptotic invariants attached to linear series", Organisers: Tomasz Szemberg, Piotr Pokora, Sławomir Rams. Participants were also encouraged to organise more informal activities and working groups. Also there was a possibility of collaboration with other scientific centers in Poland.